This set comprises shower thermostat, hand shower and shower rail. The hand shower offers two indulgent spray patterns in Rain and Jet, while maintenance is effortless with our SpeedClean anti-lime system. The integrated GROHE TurboStat technology keeps water temperature constant so no more sudden changes. GROHE SafeStop maxes the temperature at 38°C so you can't inadvertently turn it higher and scald yourself. You can always deactivate the function and go hotter if you choose. And GROHE CoolTouch means the thermostat body itself never gets too hot to handle. Presented in dazzling GROHE StarLight chrome, with ergonomically designed handles and a 900mm shower rail, this stylish set will have a big impact on your bathroom scheme. 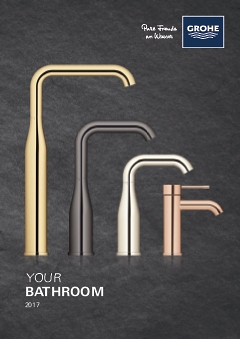 the GROHE EcoJoy feature also conserves precious water.